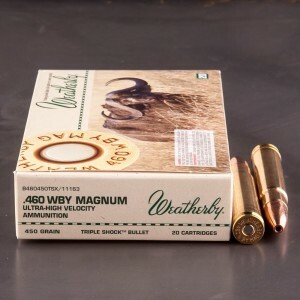 460 Weatherby Magnum rounds are very large and powerful, originally designed by Roy Weatherby in 1957. The 460 Weatherby Mag was a redesign of the popular 378 Weatherby Magnum. It utilized the 378 Weatherby case as its parent’s case, necked up to accept the larger 458 bullet. Up until 1988 the 460 Weatherby Magnum was considered the most powerful commercially available hunting round until it was dethroned by the 700 Nitro Express round in 1988. The round’s reputation for power is well earned. Because of that, 460 Weatherby Mag ammo is not for new shooters. The tremendous power of the round is followed by very sharp recoil, and a powerful concussion. A projectile weighing a mighty 500 grains is capable of reaching speeds up to over 2,500 feet per second. A round with this velocity, and weight, is capable of taking any game in the world.